And so, when it came to annual accounts back then a word processing department would create them. The accounts and trial balance would all be done manually. Then someone would Tipp-Ex out the last year’s numbers on a photocopied set of the previous accounts. Someone else would then write the comparatives in and then put in the new numbers. And then they would go off to the word processing department to be word-processed. For some of you that will seem incredible but that’s how it was done. When I first started one of my main jobs was 'calling out'. This was me and another junior colleague comparing that photocopied, Tipp-Exed version of the accounts with the final word processed version. It was a long, arduous process. In the UK, small limited companies usually quality for abbreviated financial statements – meaning that companies can file on public record much briefer accounts. But creating those was even more time consuming in 1988 and so there was a separate amount on the bill for preparing that statement. Fast forward twenty years or so and accounts production software means that abbreviated accounts are simple. They are produced by the touch of a button on a computer. They take no time whatsoever. They are a by-product. And so, in the last ten or fifteen years or so people have started giving them away for free. And yet that misses one essential fact. The value to the customer of filing a briefer set of accounts on public record hasn’t changed. So if their value hasn’t changed why are we giving it away for free? 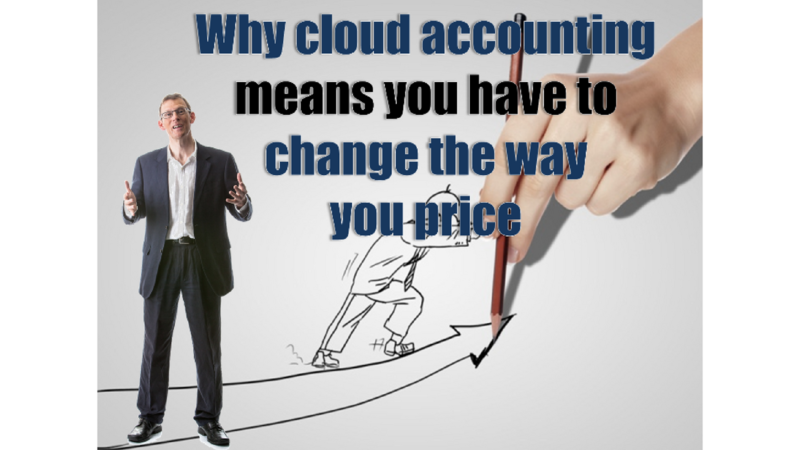 It’s the same thing about the cloud accounting revolution. Systems such as QBO means that data processing time is reducing rapidly. Indeed, it’s predicted that all too soon 96% or more of what accountants and bookkeepers do will be automated. The signs are already there. Bank feeds and external apps such as Receipt Bank already exist. They are all automation tools that are reducing data processing. And so the time spent bookkeeping is reducing. So does that mean we also give it away for free? Of course not. The value hasn’t changed. And so we should price on value. And we should use technology to make us more efficient – not to give away everything we’ve always done historically for free.